Kyle Dake accomplished quite a bit this past college season; most notably winning his fourth NCAA championship at a fourth different weight in four straight years. Because of his historic senior season, he was also named the 2013 Dan Hodge Trophy winner and Sports Illustrated’s College Athlete of the Year. But before the native of Ithaca, N.Y., could earn such prestigious honors, Dake knew he had to change something about his wrestling style this past winter: become a better pinner. “It didn’t matter that I won 3-0, 5-0 or 8-0 or 10-0. People were not impressed with that anymore,” said Dake, whose NCAA titles came at 141, 149, 157 and 165 pounds between 2010-13. “They wanted to see something bigger and better. And while Dake came just short of reaching his pinning goal — he ending up flattening 18 of his foes in a 37-0 season — Dake’s awareness of bringing the pin to his arsenal earned the four-time NCAA champion the Schalles Award for pinning. 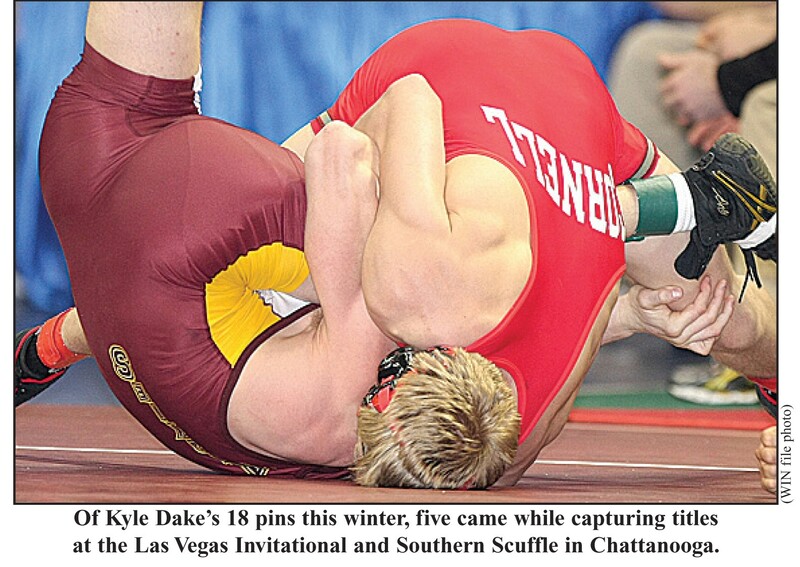 Dake, who had just 26 career pins over three seasons before the 2012-13 college season, said he did not have to change that much of his wrestling style to improve his pin totals. Dake recorded 11 of his pins in dual-meet competition to help the Big Red compile a 14-4 mark. One of those pins came in Cornell’s 37-3 victory over Bucknell, when Dake pinned Corey Lear, who was ranked ninth nationally at the time. Dake also objects to the idea that pins are a dying art in wrestling. Dake added the sports specialization has led to a larger number of skilled wrestlers. Dake said he heard plenty of stories about how Schalles created even more of a buzz as a pinner when the former Clarion star once pinned a foe on an X he’d placed on the mat before the bout. Dake said he’d like to be remembered as a versatile wrestler. “I had a variety of rides, crab ride, tight waist, cradle …,” said Dake, who earned also earned riding-time points in all four of his NCAA finals bouts.